After losing four seniors, Penn Manor Basketball may not necessarily be looking to rebuild for the future. They are looking to compete now. “I think we can compete for a section title,” said junior guard Brady Charles, who is looking to be a major contributor. The last time the Comets won a section title was 1972. The team seems to forget the last 40 years. They know they can succeed, but they need their new leaders to step up. The team will be led by seniors Marc Summy and Landon Alexcih. These two will be the core of the team, on and off the court, according to teammates including Charles. While Summy and Alexcih are key to the squad’s success, they can only get so far without the help from their role players. Good thing there’s no shortage of support for the duo. Senior guards David Burch, David Mohimani and Jay Jackson will provide wing play. Joey Jackson and Alex Quinn will contribute rebounding and post play. In addition to these experienced players, juniors Brady Charles, Daulton Parmer and Adam Hess will be important role players as well. 6’7 sophomore David Carmichael will also add size and rebounding to the team. Another important piece of the puzzle will be senior guard Reagan Forrey. 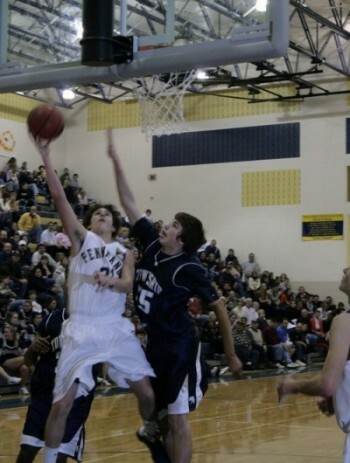 Forrey left Penn Manor after his sophomore year to attend Elizabethtown High School. Now he has returned home for his senior campaign. The Comets will also be able to rely on quality coaching. The experienced Charlie Detz will enter his third season as head coach. Detz was a two time All-American at Franklin & Marshall College as a player. He eventually went on to coach at Columbia High School and F&M before coming to Penn Manor. Assisting Detz for the second season will be Larry Bellew. Bellew began as the assistant coach for Warren Goodling at rival Hempfield High School in 1999. Goodling retired in 2010. After not being selected as the new Hempfield head coach, Bellew left the school and became the new assistant coach at Penn Manor. While the Comets have many things going for them, they will face some adversity. Marc Summy, who has played on the varsity team since his freshman year, is nursing an Achilles injury. Summy still attended open gyms and exhibition games, but as a spectator from the sidelines instead of leading the team on the court. Players and staff hope that Summy will be ready for the start of the season. Another problem is that they will face very competitive teams. McCaskey, the defending Section I champion, return most of their line up from last year. They also get a surge from transfer Devonne Pinkard, who led Lancaster Catholic to a District 3 championship. Manheim Township has a an experienced roster that will include Jomar Guerrero, Billy Vaughan-Geib, Cory Stoltz, and Niki Veronis. After losing many players to graduation last year, Drew Johnson and Mark Mangold will attempt to guide Hempfield to another solid season. Penn Manor understands the talent that they’ll be up against, but they have a strategy for success. “We won’t necessarily be better than anyone else, but we’re just going to have to out work and out hustle our opponents,” said senior forward Joey Jackson. The season kicked off with the first practice on November 18. The team had their first scrimmage Tuesday at Hershey and will have another on December 3 when they host CD East. The first games will come December 9 and 10 at the LS Tip Off Classic.